Although many say that a Red Velvet Cake is ideal for Christmas because the white exterior resembles a snowball and the interior is as red as Santa's suit, we prepare this great old Southern cake for Valentine's Day: as yummy as only passion could be! This is a collection of the best red velvet recipes we could find so far. Enjoy! This rich, chocolaty Southern favorite has its own culinary mythology: a couple at the Waldorf-Astoria, a shared slice of bright red chocolate cake, a request for the recipe, and the surprise of later finding a $100 charge on their room bill. Maybe all desserts this good deserve a legend. Make Ahead Tip: Wrap the cake layers in plastic wrap and store at room temperature for up to 1 day. Assemble and frost when ready to serve. When using cake pans, they must be greased and floured to create a thin layer of protection against the oven’s heat. For greater convenience, use a cooking spray that has flour in the mix, such as Pam for Baking, Baker’s Joy or Crisco No-Stick Flour Spray. To properly measure flour when baking, use a spoon to lightly scoop flour from its container into a measuring cup. Once in the measuring cup, use a knife or other straight edge to level the flour with the top of the cup. If the measuring cup is dipped directly into the container—a common mistake—the flour will be packed into the cup and result in extra flour being added to the recipe, yielding tough, dense baked goods. Room-temperature butter for a batter is one of the biggest culinary missteps. In fact, butter must be below 68°F to trap air molecules and build structure. Otherwise, the fat will be liquefied and the cake will be flat. To get "cool" butter: Cut refrigerated butter into chunks and let them sit in a bowl for 5 minutes before beating. Eggs must be at room temperature for the proteins to unwind enough to support the cake’s crumb. Either set the eggs out on the counter for 15 minutes or submerge them in their shells in a bowl of lukewarm (not hot) water for 5 minutes. Although you cannot overbeat the eggs, sugar and butter, you can overbeat the flour. If you do, you’ll develop the gluten and create a quick bread rather than a layer cake. Beat the flour just until there are no white grains of undissolved flour visible but not until the batter is smooth. Ingredient Note: If you prefer not to use food dye, you can omit it completely: just add 4 more teaspoons of buttermilk to the batter (your cake will, however, be more brown than red). Natural food dyes, while less vibrant than conventional dyes, are chemical-, lactose- and gluten-free, but they vary widely in availability. Check for them at your local natural-foods store. Coat two 9-inch round cake pans with cooking spray. Whisk all-purpose flour, whole-wheat flour, cocoa, baking powder and salt in a medium bowl. Beat sugar and butter in a large bowl with an electric mixer on medium speed until crumbly, about 2 minutes. Beat in egg yolks one at a time, then vanilla and food coloring (if using) until smooth. Beat in half the buttermilk on low speed until smooth, then half the flour mixture. Scrape down the sides of the bowl, then beat in the remaining buttermilk. Beat in the remaining flour mixture just until combined. Clean and dry beaters. Beat egg whites in a clean medium bowl at high speed until soft peaks form. With a rubber spatula, gently fold the whites into the batter until just incorporated, using long, even strokes. Divide the batter between the prepared pans, spreading to the edges. Gently rap the pans against the counter once or twice to settle the batter. Bake until a toothpick inserted into the center comes out clean, 15 to 20 minutes. Cool on a wire rack for 10 minutes, then invert the layers onto the rack, remove the pans and let cool to room temperature, about 45 minutes more. Beat cream cheese, confectioners' sugar and vanilla in a large bowl with an electric mixer on medium speed until smooth. Place one cake layer top-side down on a serving plate; cover with half the frosting, spreading just to the edges. Set the second layer on top, top-side down. Spread the remaining frosting on the top only. Sprinkle with grated chocolate, if desired. Preheat oven to 350 degrees. Mix all the ingredients and pour them into a heart-shaped 9"x13" pan. Bake 30 minutes until done. Let it cool and frost with cream cheese frosting done this way: in small mixing bowl, mix thoroughly 1 box confectioners' sugar, 8 oz. softened cream cheese, 1/2 cup softened margarine, 1 teaspoon vanilla extract and spread over the cake. Serve and enjoy! Grease or spray with cooking spray, two 9 inch round cake pan or the spring form cake pans. Preheat oven to 350º. Make a paste of the cocoa and red food coloring; you can add a few drops of water if needed to make the paste. Set aside. Combine the buttermilk, salt and vanilla. Set aside. In a large bowl, beat together the butter and sugar until light and fluffy. Beat in the eggs one at a time, then beat in the cocoa mixture. Beat in the buttermilk mixture alternating with the flour, beat just until mixed. Stir together baking soda and vinegar, and then gently stir into the cake batter. Pour batter into prepared pans. Bake in the preheated oven for 30 minutes, or until a toothpick inserted into the center of the cake comes out clean. Allow the cakes to cool, remove from pans, cool cakes completely before frosting. Beat cream cheese, milk and vanilla in medium bowl with electric mixer on low speed until smooth. Gradually beat in powdered sugar, 1 cup at a time, until smooth and spreading consistency. Spread ¼ of the frosting on the top of the first cake layer, place the second layer on top. Spread the remaining frosting over the top and the sides. Sprinkle almonds on top and the sides of the cake. Cut a heart shape out of the center of a piece of paper, place the heart cut out in the center of the top of the cake and sprinkle with red candies. You don't have to wait until Valentine's Day to use this cake pan. It's also perfect for birthdays, anniversaries, Mother's Day - anytime you want to show someone how much he or she is loved. Excelle Elite, Wilton's premium bakeware line, combines superior nonstick performance with an elegant design for the highest level of baking satisfaction. Included in this line is this heart cake pan with high, straight sides. The pan is made of heavy-duty steel so there's no warping even through years of use. Has a 10-year warranty. Bake a cheesecake or a layered, gelatin dessert in the shape of a heart! After baking, unsnap the buckle on the side and your dessert comes out perfectly with no torn or messy sides. Excelle Elite, Wilton's premium bakeware line, combines superior nonstick performance with an elegant design for the highest level of baking satisfaction. Included in this line is this heart springform pan. The pan is made of heavy-duty steel so there's no warping even through years of use. Has a 10-year warranty. Kaiser Bakeware offers the broadest product range in the bakeware industry offering both classic and creative shapes. Known for bakeware innovations, Kaiser invented the springform pan, the "intelligent round cake pan" and is the world's largest manufacturer. Kaiser bakeware products have been made to the highest standards of German craftsmanship for over 85 years. Manufactured from steel base metal, the products provide even and gentle heat distribution for even browning and baking. The KaiserCast product line includes tube pans and flan pans featuring cast aluminum construction with a two-layer non-stick surface for quick and even browning as well as easy clean-up. This Heart Mini Flan Pan measures 7 inches and has a capacity of 2 cups. IS YOUR BELOVED FAR FROM YOU? If you have a long-distance relationship and your dear can't taste the delicious red velvet cake you're going to prepare with our recipes, you may be interested in this. Bake Me a Wish' gourmet cakes, baked in their award-winning New York City bakery, can be sent overnight, nationwide and are guaranteed to arrive on the day you request or your money back. Each cake is adorned with a decorative chocolate LOVE plaque imported from Belgium. Make your loved one’s day an occasion to remember by sending a gourmet Red Velvet Chocolate Cake from Bake Me A Wish! A Southern classic, this rich red chocolate cake is filled and covered with pure cream cheese frosting, with white chocolate sprinkled around its sides and the Belgian chocolate plaque of your choice on top. 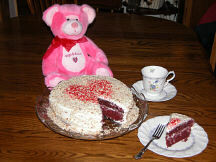 Send a Gourmet Valentine's Cake - How Sweet Are You? Should Superbowl food fill a super-bowl?